The most common cockroaches in the United States include the German, American and brownbanded species. Each type of cockroach prefers specific environments. While German cockroaches are the most frequent kitchen invaders, American cockroaches are partial to damp basements. Brownbanded cockroaches often invade furniture, closets and appliances. Many cockroaches live a year or more. Anyone who has ever dealt with a cockroach infestation won't be surprised to learn that cockroaches eat almost anything. That goes beyond food products -- they'll also consume hair, grease, cotton, feces, even books and paper. Cockroaches are hardy -- they can live for two weeks without food and water, and six weeks without food if there's a water source. As cockroaches feed, they also defecate, meaning you have cockroach poop on anything they've run across. Effectively getting rid of cockroaches means removing their food and water sources -- not an easy task. As nocturnal creatures, cockroaches spend the day resting, preferably in warm crevices. That doesn't only mean they invade cracks and holes in the home -- the interior of electronic devices and appliances is modern cockroach habitat. If you're dealing with an infestation, one simple method of discerning cockroach living space consists of turning the light on in the dark kitchen -- or any other infested area -- and taking note of where the roaches scurry. A grown cockroach can fit into a crack measuring at least 1/16 of an inch. Those cockroaches infesting your home groom themselves frequently. They do so by running their legs and antennae through the mouth, cleaning themselves with bodily secretions. 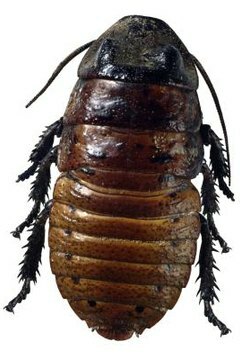 Dirty cockroaches become impaired, unable to navigate properly or find food or mates. The amount of eggs produced by female cockroaches vary by species. They create egg cases days after mating, leaving them in hidden areas, like cracks. Female German cockroaches don't deposit their egg cases, but carry them along until hatching. The female American cockroach doesn't even require males for mating -- she can reproduce parthenogenetically. The eggs hatch into nymphs, similar into appearance to adult cockroaches but lacking wings. In a few months, they are adults.